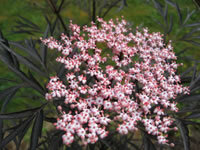 European Elder plants, also known as Black Lace Sambucus, are fast growing, low maintenance, multi-stemmed deciduous shrubs that will grow to about 10 feet tall. They have deeply veined, serrated foliage and produce large flat clusters of flowers in late spring to early summer, followed by small black berries which provide food for many species of birds. 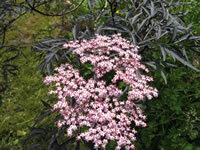 Black Lace Sambucus plants are hardy in USDA zones 4-10. Begin with your container. Be creative when selecting a container. Dont limit yourself to what you have already seen. Anything that is or can be waterproofed can work. Whiskey barrels, troughs, birdbaths, lotus bowls, your college ceramic project, basins, wooden boxes... almost anything goes! When choosing a container, keep in mind what you want to put in it. Research the plants you like and be sure your container is deep enough to house them. Plants like water lilies need at least 5 inches of water above the top of their pot, while floating plants like water hyacinths and water lettuces can be grown in a salad bowl! Do you want fish? If so then your pot needs to be large enough to house a small pump and filter set-up in order to keep your fish at optimum health. The easiest route is to choose one that is already waterproof. Plastic, ceramic, or concrete containers without drainage holes are ideal. They require little to no alteration to get started. (Keep in mind, though, that if you live in an area where water freezes solid in the winter, concrete may crack.) Even wood boxes will work when lined with a EPDM liner. These liners are fish-safe and are available at home centers and aquatic gardening shops. You can also find a brush-on sealant made specifically for aquatic gardening. Filters and pumps are only absolutely necessary when you have fish, but a small pump with a bubbler or fountain will not only make you garden more aesthetically pleasing, it will also keep it healthier by oxygenating the water. Before shopping for a pump, determine how many gallons of water you have and how fast you want to move it through your fountain, if applicable. Pumps, fountains and filters can be purchased at home centers, garden shops, and some pet stores. Once you install your pumps, filter and fountain, you are almost finished! After filling with water, let the garden sit for about two weeks to allow the chlorine and chemicals to dissipate. You can hurry this process along by adding a dechlorinator. Then you can add your plants. 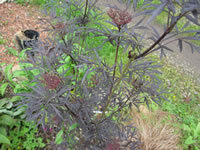 Choosing a variety of plants will make your feature more interesting. Look for different heights, colors, and textures. You can also add your fish at this point. Smaller goldfish, like shibunkins, comets or fantails do well in containers as long as they have adequate oxygen, water quality and shade so that they do not overheat. All that is left to do now is to find a comfortable seat and place it nearby so that the next time you are exhausted from weeding you can plop down and relax while you enjoy the soothing sounds and beauty of your new garden.